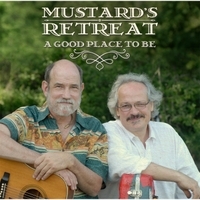 This CD marks the beginning of our fortieth year of writing, singing and making music together as Mustard's Retreat. An eclectic collection, as are all our recordings of where we have been over the past few years. Many of these songs are already fan favorites; all are favorites of ours. We are rooted in the folk music of the early 60s, as well as the singer/songwriter movement, and never have seen any reason to not just play and write what we enjoy. It has paid off in a long career and loyal fans who appreciate our looking to share real experiences, and not sell them something canned.